The designer of the graphics chips for the iPhone 6s and HTC One M9+ is setting its sights lower for its next generation of products, a move that spells good news for mobile gamers with a smaller budget. Imagination Technologies is improving the performance of its graphics chip designs for low-cost devices, and providing an extra boost as it opens the way for more efficient software too. Like ARM, Imagination designs processor cores but does not make chips. In ARM’s case, it designs the eponymous ARM microprocessor cores, while Imagination has three main business lines: MIPS microprocessor cores, PowerVR graphics cores, and Ensigma software-defined radios. Customers license ARM’s or Imagination’s core designs, extend them with other functionality and turn them into chips. Ultimately, it’s their know-how that provides a lot of the performance in smartphones and other consumer electronics devices. For instance, the graphics capabilities of the iPhone 6s and 6s+ are provided by a PowerVR graphics core, which Apple has incorporated into its A8 chip alongside a microprocessor core design from ARM. HTC’s One M9+ has a Mediatek MT6795T system on chip with Imagination’s PowerVR G6200 graphics core inside. These phones are already the most expensive in their manufacturers’ ranges, so the logical way forward for Imagination to use improved performance to grow its market share is to head downmarket, and look for economical ways to improve the graphics capabilities of cheaper phones. That’s where the company is heading with chips based on its PowerVR Series 8XE designs, which offer low-cost phone makers a double benefit: faster performance than chips based on previous XE designs, and a more compact design. The Series 8XE designs run some benchmarks up to twice as fast as their predecessors, the company said. 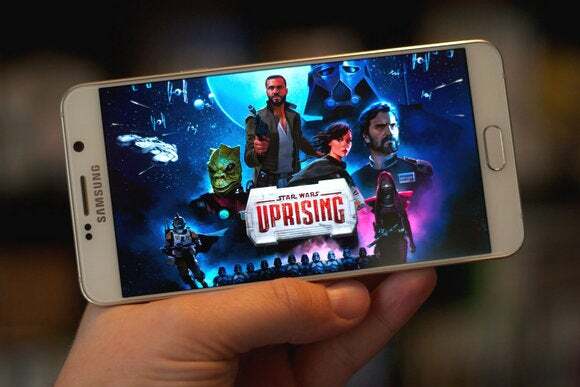 That’s bound to be good news for low-end smartphone buyers wanting to play action games. The new designs also include support for OpenGL ES 3.2 and Vulkan 1.0, graphics libraries that OS and app developers can use to perform high-level functions such as shading and lighting of scenes in games. The company has promised to invest more in PowerVR as it refocuses following a difficult year. PowerVR is not just about the smartphone market for Imagination: It also expects the new designs to find applications in embedded devices and the automotive industry, where graphics processors are increasingly used in the computer vision systems of self-driving vehicles for analyzing video streams. Both markets could benefit from a new feature of the Series 8XE core designs: Support for Imagination’s OmniShield virtualization system, which allows programmers to separate and compartmentalize processes for security or availability reasons. If one process crashes or is compromised, it won’t bring down others, or provide a way for attackers to compromise others. In the mobile market, that’s important for cryptographic, authentication or payment functions. If the chips were used for automotive applications, keeping the Internet-enabled entertainment system walled off from the braking or steering systems would have significant safety implications.